I'm not saying dooku should be nerfed, but with 100% counter I don't think he should double-counter. And maybe make him a little more durable. He's a bit too squishy. I'd like to see him last more than 1-2 rounds. He'd still be a solid character and unique. You just wouldn't see as many 4-6-8 consecutive hits. I just burn him down first. Honestly I'd even go as far as lowering his counter rate to 75%, and beef up his dodge/health a bit. But then people might go crazy.... Just take away the double counter. I love teams with Dooku, he dies in two hits. I add my own voice over when he attacks, lol. If you lower counter and increase health he would be no different than Fives. I'd rather have more of unique / original toons, that are all dangerous in a right squad. I'm not screaming Nerf! Honestly he's too squishy and I'm tired of double-counter-crit-stuns. I'm just suggesting a minor balancing. My opinion. 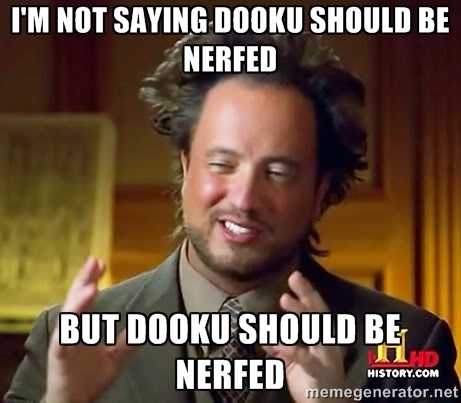 You're not saying Dooku should be nerf but they should nerf him??? Do you even understand what you're saying? ALL characters who counter counter with their basic attack. This means 5's can inflict speed down, Aayla can call an assist and stun, Kylo can inflict healing immunity etc. And Dooku has a 50% chance to atack twice. Remove that and he goes from decent allrounder to one trick pony. No, they shouldn't nerf him. Yes, removing his ability to attack twice would be a nerf. Please stop makin these threads. Dooku is not overly used in the top teams (at least not in my arena), which is a pretty good indication that he is in fact not OP. I pray when I see Kylo, Aayala, Dooku, and Fives on the Same team. This has been discussed. Stun him. He will go down easily. Then you can worry about the next character. Yes you are asking for a nerf, and the reason why he shouldn't be nerfed you wrote it yourself. I'm also tired of Rey kicking my **** but not asking to nerf her just because I don't have her maxed yet and others do. It wouldn't be fair, don't you think? I want to see him BALANCED, not nerfed. But you can't just do that and keep everything else, then he'd be real trouble. Let's all take a breath and take the time to read what I said. And he wouldn't be just like fives.... Fives is pure health. I want to see more lightning. He IS a 1-trick pony currently.... 1-lightning and counter-fest. That's it. Make him more durable. I was afraid ppl would scream OP if I went with that approach.... I see now my fear was in the wrong direction. There is no real reliable stun... At least none I know of. You got more chances of taking him down in 1-2 hits than stunning him. All those multi-attacks going off is one of the most beautiful mechanics in the game to watch. You want to take that away? Shame on you. An enemy Dooku has never been the deciding factor in a match for me. Calm down, nobody's touching your precious dooku, keep him as a easy-to-dispatch 1-trick-pony and continue to attack anyone who mentions a possible alternative to his current setup. Believe it or not, free speech also includes speech you dislike. Nobody is suppressing your right to express yourself. We just don't agree with what you are suggesting. Just that. Other than that he's fine. He'd still be a solid character and unique. 2 months ago I started a nerf Dooku thread. Back then I didn't have a variety of characters I could choose from. Now I'm sitting on 43 characters open with 14 of them being geared and leveled up enough so I could pick and choose my squad to help me with dooku. Everyone else was right and I was wrong. Yes dooku can be aggravating with multiple counter attacks but you just need to stun him then burn him down. If you think dooku is bad wait until you meet up with geared up Rey and fives...those are the ones giving me trouble but I'm sure I just have to deeping my squads and they will be easier. How did free speech lose if that same concept was used to voice opinions contrary to your own? Other than that you can't ask for a nerf and then claim you're not really asking for a nerf. You're gonna get pounced on. ...... So any change to a setup is a Nerf? To me Nerf is a significant decrease in overall power and usability. I tend to post in successions, I see now that's dangerous. Anybody else i should stay away from mentioning if I don't want everyone to freak out like that? Dooku goes first. Then my Sid goes . I usually target Dooku. He'll do his fancy dance, and retaliate. Eeth Koth goes next. I would say that I am at about 80% success in stunning Dooku. If I don't stun, I lose. If I stun, usually the next hit takes him out. Increase multi-attack chance to 75%.